First Transit drivers Wayne Tucker, left, and Richard Dubin, right, celebrate their organizing victory after voting “Yes” for IAM representation. 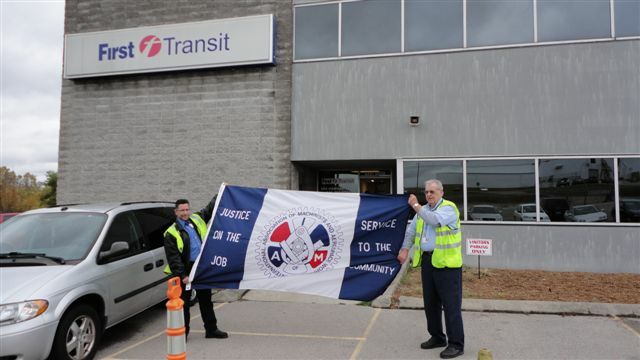 Sixty-two drivers and mechanics at First Transit in Nashville, TN voted “Yes” for IAM representation. The workers drive the shuttle buses for short- and long-term parking at the Nashville airport, and the mechanics maintain the buses. “When I’d park to fly out of the airport, I got to talking to some of the drivers,” said District Lodge 711 Business Representative Tim Wright. “I found out they needed a union, so we started a campaign. The drivers and mechanics’ issues were pay, working conditions and basic respect on the job.